This week, we bring you exclusive previews of the upcoming edition of Eagle Eye, which will be distributed to all staff and students at the end of the month. Jointly produced by RI’s Corporate Communications Department and Raffles Press (Yr 5 – 6), Eagle Eye is the school’s official magazine. Uniformed Groups (UG) members no longer have to bid farewell to their CCAs in Year 4. Whereas previously, students who returned to their UGs after Year 4 did so on an ad hoc basis with no formal system of accreditation, from 2012 RI has begun to formally recognise Year 5 students who continue their involvement in UGs. Year 5 UG members have different responsibilities. They play an instrumental role in passing on their experience and knowledge to their juniors, be it through direct involvement in training sessions or mentoring younger members. The school has not let these endeavours go unnoticed. While they might not be as glamorous as certain sports or arts CCAs, the UGs are recognised for the integral part that they play in student development. The school has incorporated several elements of their training into the Raffles Diploma. The current framework allows for members to achieve the Merit and Distinction tier in the Character and Leadership domain. While UGs are often associated with young boys in sweat-filled shirts doing push-ups under the sun, this stereotype does not always hold. Year 5–6 students from Raffles Girls’ School have also returned to their alma mater to continue their involvement in UGs. 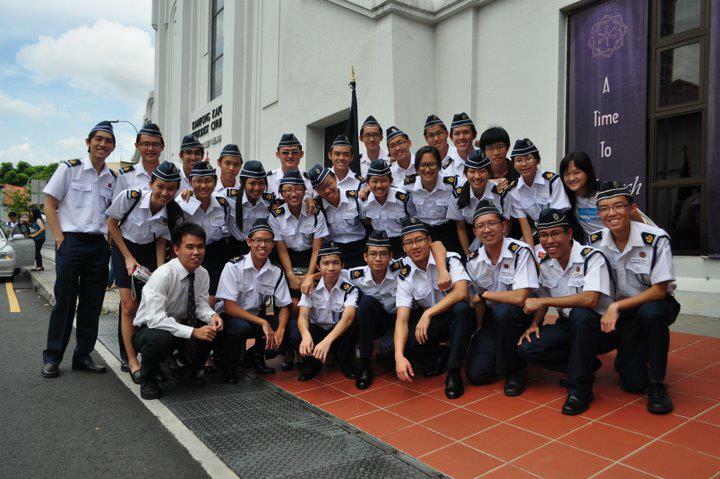 More interestingly, there are also RGS Girls’ Brigade members who volunteer with the RI Year 1–4 Boys’ Brigade. Despite having to transition from an all-girls environment, Year 5 Primer Felicia Goh (13SO7B) feels that their relationship with the boys became less awkward as they spent more time together. ‘We have to make them do push-ups when necessary, but it really breaks our hearts to make them do so. They are all the little brothers we never had,’ she adds. One concern arising from this trend is that Year 5s may take away leadership opportunities from Year 3s and 4s. Another potential concern is that students returning to help their UGs might not have the chance to explore other CCAs in Year 5–6. Fortunately this is not the case. Even as Year 5–6 students return to their UGs, they simultaneously pursue new activities. Regardless of which path a UG leader takes, one thing is clear: the passion to give back is still alive. With the trend of Year 5–6 students continuing their involvement, this passion does not have to come to an end at the end of Year 4. Eager to hear straight from the mouths of those who have “been there, done that”? Read the print edition of the Eagle Eye. Eagle Eye preview: ROAM: From Respighi to Russia’, was a concert jointly organised by the Year 1–4s of the RI Military Band (RIMB) and RI Strings Ensemble (RISE), and Year 5–6s of the Raffles Symphonic Band (RSB) and RI Chamber Orchestra (RICE).